The First World War ended 100 hundred years ago in 1914, when the Armistice of Compiègne, the peace contract everyone had waited for, was signed ‘in the eleventh hour of the eleventh day of the eleventh month’. One of the biggest bloodsheds in human history finally ended with a victory for Great Britain and the Allied Powers that had demanded many lives and sacrifices on all sides. 2018 marks the 100th Anniversary of First World War, which is remembered in one of the largest and most important commemorations of our generation. The deadliest conflict in human history at the time finally ended one hundred years ago with the victory of Great Britain and the Allied Powers. The long-awaited Armistice of Compiègne was signed by the German Empire ‘in the eleventh hour of the eleventh day of the eleventh month’ in 1918. This gruelling, first global war has had a lasting impact not only on the history of the United Kingdom but on the whole European continent and finally the entire world. From the outbreak 1914 to the armistice 1918, all sides suffered huge losses of life- more than 9 million soldiers and 7 million civilians died during the conflict. To celebrate the end of WW1 and reflect on the battles and events of the Great War, a series of special ceremonies, services and exhibitions are taking place throughout the country this year. 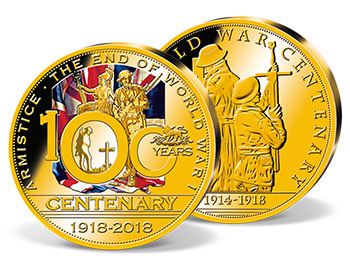 We are delighted to join the commemoration ceremonies with a stunning strike - layered with 24-carat gold and finished with sought-after colour detailing – a new edition especially issued in remembrance of the Centenary of the Great War. Minted in highest quality ‘proof’ and preciously layered with finest 24-carat gold and rare colour finishing, this exclusive strike is limited to just 1,918 complete collections worldwide. 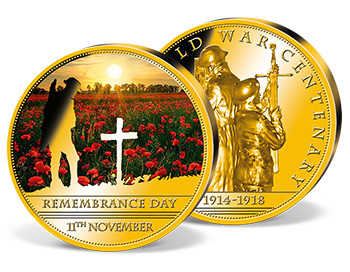 A stunning commemorative to mark the Centenary and to honour all the brave servicemen and women of the First World War, and also a reminder to all nations that a bloodshed on such scale should never be repeated! Lord Kitchener, British secretary of state for war at the beginning of WW1, was a very resourceful leader, organising volunteer armies for Britain on an unprecedented scale. He was depicted on one of the most iconic British army recruitment posters ever produced. The commanding, moustached face of Lord Kitchener, with a finger pointing at the British people in a demanding gesture to emphasize the slogan "Your country needs YOU!" became an enduring image, representing the pressure on our British nation during WW1. At the very moment, Britain became involved in The War, Field Marshal Earl Horatio Kitchener reluctantly accepted the appointment of secretary of state for war. Unlike many other government and military officials, he anticipated a war lasting for many years and planned insightfully and accordingly. Lord Kitchener rapidly enlisted and trained the largest volunteer armies ever known in Britain, consisting of hundreds of thousands of volunteers, known as the ‘Kitchener Armies’. The public worshiped Kitchener, who embodied the British war effort like no other, but the cabinet gradually stripped him of many of his responsibilities and he and his staff died in June 1916 along hundreds of men, when his ship, the HMS Hampshire, struck a mine laid by a German submarine and sunk. Several films explored the circumstances of the sinking and Kitchener’s death is a salutary tale about the fate of heroes. On Christmas Day 1914, during the Great War, the infernal sounds of bombing and shooting fell silent along the Western Front. This Christmas Truce became one of the most legendary stories of the First World War. Although the High Commands on both sides of the trenches refused to declare any official cease-fire, the soldiers unofficially declared their own temporary truce after months of heavy battles across the Western Front. On Christmas Eve, German and British soldiers, stuck in the morass of their wet and cold trenches started to sing Christmas carols on both sides, candles and trees went up along the lines. In several places soldiers even left their sheltered positions and met in the muddy ‘no man ‘s land’ between the trenches, shook hands, took photographs, exchanged little gifts and even played some impromptu games of football on the battlefields. They repaired trenches, buried their dead comrades and, after Boxing Day, started to return to fighting. Even though some officers felt that the truce would undermine the soldiers’ fighting spirit and the Christmas truce was not observed everywhere along the Western Front, the heart-warming story of the Christmas Truce made history as a symbolic moment of human spirit and peace during World War I and proved that even this brutal clash of weapons could not destroy the holy Spirit of Christmas. In 1918, the entry of American troops and resources into the Western front finally turned the balance in favour of the Allied powers. In the early morning hours on November 11, 1918, just north of Paris in the Forest of Compiègne, high military personnel, representing the Allies and their last enemy Germany, held a secret meeting in a private railway carriage. At 11am on the 11th day of the 11th month of 1918 the guns of Europe finally fell silent on land, sea and air after more than four years of fighting. Following the signing of an armistice agreement by the German Secretary of State and peace advocate Matthias Erzberger, the Allied supreme commander Marshal of France Ferdinand Foch and the British First Sea Lord Admiral Rosslyn Wemyss, a ceasefire was in place – one which had to be renewed three times - until the Treaty of Versailles was agreed in June 1919, officially ending the hostilities of WW1. This remarkable date is now known as Armistice Day, and since 11 November 1919, when George V introduced ‘Remembrance Day’, the nation gathers each year at 11am on the 11th day of the 11th month to commemorate the murderous war of four years, paying tribute to all the brave soldiers and servicemen who lost their lives in the Great War. This is the start of the world-famous poem, written by the Canadian soldier Lieutenant Colonel John McCrae in the spring of 1915. Shortly after his friend fell in Ypres, Belgium, the Canadian doctor McCrae, was inspired by the sight of poppies growing in blasted and bombed battle-scarred fields to write the poem ‘In Flanders Fields’. These bright red Flanders poppies (Papaver rhoeas) are delicate, but very resilient flowers, and grew in thousands, flourishing in the middle of blood-soaked battlefields, marked by chaos and destruction. After the First World War, the red poppies of the poem were adopted as a symbol of Remembrance, representing the blood of the fallen since 1914. Thanks to the popular ‘Remembrance Poppies’, worn by many people in Britain, a considerable amount of money was raised each year to help WW1 veterans with employment and housing. Remembrance Day became part of modern British life, culture and heritage and is observed each year in public and private, in formal and casual events with a two minute silence at the eleventh hour of the eleventh day of the eleventh month, to mark the end of the First World War and remember and honour all those who have sacrificed themselves to protect and secure the freedom of our nation. The First World War was a turning point in world history and forever changed the face of the 20th century. It was a conflict between the major European powers, later joined by America, unparalleled in its scale. Due to new military technologies, the power unleashed in these four years of ‘Great War’ resulted in unprecedented levels of death and destruction, unparalleled in previous world history. By the time the war was finished, its legacy was devastating. The Great War took the lives of more than 9 Million soldiers and 7 million civilians, irreparably damaged the previous world order and completely redrew the map of the European continent. 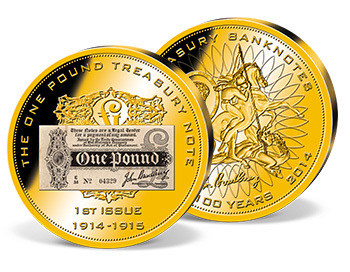 During and after the war gold coins became rare - the ‘Currency and Bank Notes Act 1914’ was passed, giving the Treasury temporary powers to issue banknotes to the value of £1 and 10/- (ten shillings) in the UK. These treasury notes had full legal tender status and were not convertible to gold through the Bank of England to prevent a run on sterling and to enable raw material purchases for the production of weapons. One hundred years ago, the First World War raged on the Western battlefields at the Marne and the Somme, in the East between Romania and the Styr, and in the South at the Isonzo. By the time the war was finished, its legacy was devastating. The war took the lives of more than 9 Million soldiers and one million civilians as a direct result of military operations and the lives of further 6 million civilians through disease, starvation and hardship. 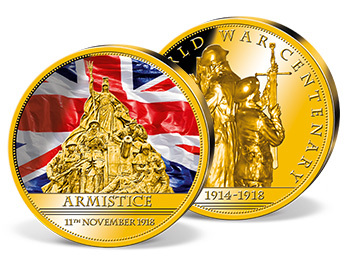 The unique, complete ‘Great War Centenary’ commemorative set commemorates the dark years of the First World War between 1914-1918 and the heroic sacrifices of many brave servicemen and women. 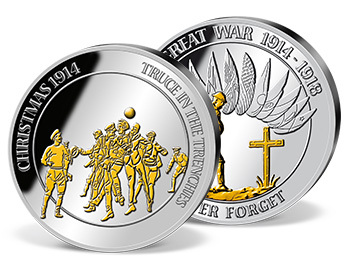 Each individual commemorative strike has been preciously layered with 24-carat gold and pure silver, and masterfully engraved to depict important events and heroes of the Great War. 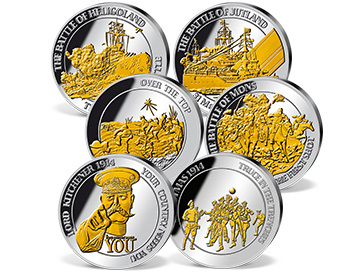 Secure now your own piece of British history in the most impressive way - a set of six stunning commemorative strikes, each preciously layered with 24-carat gold and pure silver. During this widespread ‘first war of the nations’, Great Britain, France, Russia, Italy, Romania, Japan and the United States (the so-called ‘Allied Powers’) fought a four-year battle against Germany, Austria-Hungary, Bulgaria and the Ottoman Empire (the so-called ‘Quadruple Alliance’). Due to new military technologies, the power unleashed in this Great War resulted in unprecedented levels of carnage and destruction, unparalleled in previous world history. The horror caused by modern warfare was immense. The new armies counted millions of soldiers, and modern and deadly weapons, produced in huge quantities, rapidly caused heavy casualties and destroyed whole communities and landscapes. New aircraft, entering the battles, took death and destruction to the skies as well. Soon, the soldiers dug themselves into trenches, and the Western Front became the setting for an infernal war of wastage that would last almost four years. By the time the war was finished, its legacy was devastating. The war took the lives of more than 9 million soldiers and one million civilians as a direct result of military operations and 6 million civilians through disease, starvation and hardship. Not to mention the number of wounded people, more than 21 million in total. Some recovered, others were never the same again, neither physically nor mentally. The old-world order was irreparably damaged, burying some ancient and proud empires like the Austrian-Hungarian Empire and Turkish ‘Ottoman’ Empire in the cemetery of history. Russia was roused by revolution and became the world’s first Communist state in 1917, spearheaded by Vladimir Lenin and his Bolsheviks. In short, a whole new world order emerged. But what was the reason for that bloody confrontation that first started in the heart of Europe and then captured nearly the entire world? The initial spark was the assassination of Archduke Franz Ferdinand - heir to the Austrian-Hungarian Empire – in Sarajevo, Bosnia. His death along with his wife Sophie at the hands of Gavrilo Princip – an ethnic Serb from Bosnia, which Austria-Hungary had annexed in 1908 – culminated in the outbreak of the First World War. In fact, tensions had been rising throughout the European continent for many years. But this assassination quickly escalated into a chain of events - comparable to a domino effect. Serbia was supported by Russia, and Austria-Hungary was urged by the German Emperor Wilhelm II to use force and promised backing in the so-called secret ‘Potsdam blank cheque’. France and Russia had allied in 1891-19´894, and in 1904 Britain had joined the alliance. On July 28 in 1914, Austria-Hungary declared war on Serbia, and within a week, Britain, France and Russia formed the Triple Entente, while Germany, Austria-Hungary and Italy formed the Triple Alliance. World War I had begun. Germany instantly took the initiative and followed the so-called ‘Schlieffen-Plan’, an aggressive military strategy to invade France through Belgium and to confront Russia in the East. On August 4, 1914, German troops crossed the border into Belgium, bringing death and destruction to Belgian civilians, to finally confront French and British forces on French soil in the First Battle of the Marne on 6-10 September 1914, only 30 miles from Paris. The victory of the Allies stopped the aggressive German offensive, but led to both sides digging trenches in the mud, which was to become the scene of a four-year trench warfare gridlock. During this draining time of war, one particularly long and costly battle was fought at Verdun, where troops of both sides suffered close to a million casualties. Britain decided to enter World War I on the side of the Entente, mainly to defend the liberal values of the 19th century - the rights of small nations and the rule of law. Entering the war was also of strategic importance: The marine power Great Britain would not permit any powerful, hostile European power to dominate the European Mainland and thus threaten the English Channel. The Royal Navy remained Britain’s strongest weapon during the Great War as it successfully prevented German naval forces from breaking out of the confines of the North Sea. Through these measures, maritime trade between the Allied Forces and the rest of the world, including the United States of America, were enabled to be continued. Britain became the (financial) backup and arsenal of the Entente powers. While the Western Front had reached stalemate, Russian forces conquered the areas of East Prussia and Poland on the Eastern Front, held by the Germany, but were driven back by German and Austrian forces at the famous Battle of Tannenberg in late August 1914. Although Russia’s army started several promising offensive campaigns in the years 1914-1916, the disorganized Russian forces were unable to break through the German lines. Tensions in the Russian population grew with the defeat on the battlefield, with economic instability and devastating supply shortages, preparing the ground for the Russian Revolution of 1917. The Bolsheviks had seized power and ended the rule of the czarist family. Russia withdrew from World War I soon after negotiating peace with Germany. As the war proceeded, further aggressions drew in other countries, including the U.S. Initially, the role of the United States in WWI was very restrained due to its isolationist policy at the time of the outbreak of the war in 1914. Nevertheless, in light of the German submarine attacks against neutral ships, America was not able to maintain their isolationist role and wait for the war to end. On April 2, 1917 President Woodrow Wilson asked the U.S. Congress to agree to a declaration of war against Germany and on April 6 the United States entered the First World War. By autumn, 1918, the Central Powers were struggeling on all fronts. The Turks signed a treaty with the Entente powers in late October 1918. Austria-Hungary slowly broke up due to growing nationalist movements among its multi-ethnical population and accepted an armistice agreement with the Entente Alliance on November 4. Bereft of manpower and supplies on the battlefield, threatened by imminent invasion, the gradual surrender of its allies and growing discontent on the homefront, Germany was finally forced to call for a ceasefire. On November 11, 1918, an armistice agreement was signed in an old railway carriage outside of Compiègne. At 11am on the 11th day of the 11th month of 1918 the guns of Europe fell silent after more than four years of war and finally ended the most horrible and preposterous bloodshed of all time. Despite huge human sacrifices, the end of the Great War created a mutual comprehension of history, which even a century later still links people from many different nations. 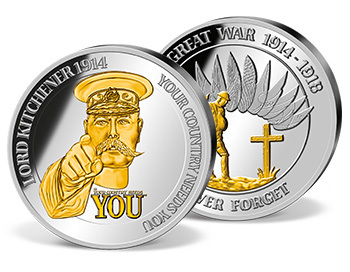 Joining the whole nation and many other countries around the world, Windsor Mint commemorates the centenary of the end of WW1 with our exquisite coins and commemorative strikes.